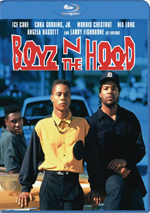 In 1991, director John Singleton caused a major splash with Boyz N the Hood. 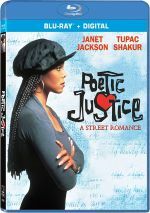 Two years later, Singleton delivered his follow-up, a more romantic tale called Poetic Justice. After the murder of her boyfriend Markell (Q-Tip), college student Justice (Janet Jackson) bails on school. Instead, she becomes a hairdresser in South Central LA. Depressed about Markell’s death, Justice shuns her friends and copes via the composition of poetry. When she winds up on a long car ride with a postal worker named Lucky (Tupac Shakur), Justice also starts to see a way out of her emotional funk. Inductees into the Rock ‘n’ Roll Hall of Fame, the musical careers of Jackson and Shakur became so successful that we tend to forget both earned early fame as actors – sort of. Jackson’s initial show business stint focused on her roles in TV shows like Good Times and Diff’rent Strokes, but her connection to her famous brothers meant work in music seemed inevitable. As for Shakur, his early days in music and acting ran fairly parallel. Whereas Jackson had been a TV actor for years before she released her first album, Shakur launched both careers around the same time, and I think his initial burst of public notoriety came from his work in 1992’s Juice. It seems interesting to see Jackson and Shakur together due to their dual careers, though they certainly stood at different places in terms of fame circa 1993. Whereas Jackson had released three massively successful albums - Janet. had just hit the shelves when Poetic debuted – Shakur’s biggest sales remained in his future. While his musical career took off, Shakur still found time for movies, as he made four more films before his murder in 1996. On the other hand, Jackson didn’t appear on the big screen again until 2000, when she played a supporting role in Nutty Professor II. Whatever cinematic talents Shakur and Jackson possessed, we don’t see them on display in the surprisingly dull Poetic. While Singleton views the film as a romance, he spends too little time on that subject for it to develop in a satisfying manner. In general, Singleton seems more concerned with “life in the hood” topics than narrative development or real drama. This changes somewhat as the movie progresses, but Lucky and Justice never quite get the exploration they require to become vivid, compelling characters. Shakur and Jackson make for an attractive couple but they display iffy chemistry together. As good as they look, they never feel like they exist on the same page, so their interactions lack sizzle. Part of the problem stems from the way in which Poetic spends far too much time with ancillary characters. It often feels like we know more about Justice’s friend Iesha (Regina King) and her boyfriend Chicago (Joe Torry) than Justice/Lucky. I suspect that’s because Singleton seems more fascinated by a fiery relationship on the rocks than the burgeoning love between Justice and Lucky. Other secondary roles also fill too much space and imply Singleton’s general lack of interest in the new romance of Lucky and Justice. Without faith in the core characters and story, Poetic stumbles, and it doesn’t help that the film occasionally grinds to a halt for lectures on social subjects. A sloppy mix of melodrama and thin characters, the movie disappoints. Poetic Justice appears in an aspect ratio of approximately 1.85:1 on this Blu-ray Disc. This was a dated but generally positive presentation. Overall sharpness seemed fine. A handful of shots provided mild softness, but the majority of the film offered fairly positive delineation. I saw no issues with jagged edges or moiré effects. Print flaws remained absent as well, and with a light layer of grain, I didn’t suspect any issues with digital noise reduction. Colors tended toward a natural – albeit low-key – palette. The Blu-ray didn’t give these hues great life, but they felt well-rendered for the most part. Blacks appeared acceptably dark and tight, while shadows brought us appealing smoothness and clarity. I thought the image held up fine over the last 26 years. The DTS-HD MA 2.0 soundfield stayed mainly rooted in the front spectrum, where it did fairly well for itself. The mix presented good ambient sound from the side channels, and all of the audio blended together smoothly. Effects were clear and realistic, and they lacked distortion. The score and songs came across nicely, as these sounded bright and full, with some good depth to the range as well. The audio mix certainly won't make your list of "demo discs", but it succeeded for this kind of character film. A few extras appear, and we get an audio commentary from writer/director John Singleton. Recorded in the late 1990s, he offers a running, screen-specific look at aspects of his career and the film’s story/characters, cast and performances, sets and locations, influences, music, and related domains. For the movie’s first act, Singleton offers a reasonably good overview, as he gives us some useful insights. After that, though, he tends to lose the plot too often. This makes much of the commentary sputter. While we still get the occasional useful nugget – especially when Singleton discusses Tupac Shakur - a lot of the track passes without substantial information. New to this Blu-ray, we find a featurette called Revisiting Poetic Justice. In this nine-minute, 38-second piece, Singleton discusses the project’s roots and development, the film’s place in his career, and cast and performances. Some of this repeats from the commentary, but Singleton adds some new perspectives here. 10 Deleted Scenes fill a total of 14 minutes, 34 seconds. Like most cut sequences, these tend to focus on secondary characters/situations as well as a little exposition. Also like most deleted scenes, they don’t present much of interest, so don’t expect them to add much. In addition to the film’s trailer, we find a screen test. With this two-minute, 12-second reel, we see Janet Jackson and Tupac Shakur together along with narration from Singleton. It’s a fun addition. John Singleton’s second movie, Poetic Justice fails to live up to the hopes he created with his debut. A muddled mix of melodrama and romance, the story and characters fail to make a positive impact. The Blu-ray brings generally good picture and audio along with a decent set of supplements. This never becomes a truly bad film, but it fails to capture its subject matter well.